I'm a big admirer of Right at Home and its owner, Nicole. She's an uber talented college student who also runs a fantastic stamp company. Not sure how Nicole does it all, but she does, and she does it very, very well. Even the banner (above) she designed for today's post is gorgeous! 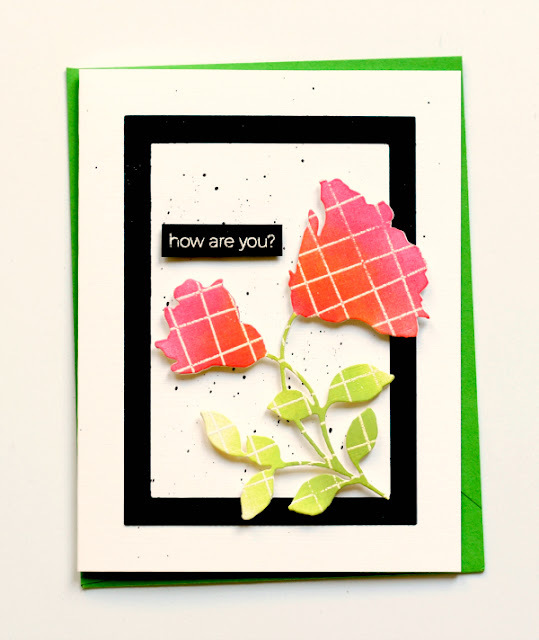 Stamped the Grid Background Stamp in Versamark ink onto white linen cardstock and embossed with white powder. Die cut with a Penny Black die. After masking, I blended Distress Oxide inks over the flowers and the leaves and adhered it to 3 more die cuts. I love how the grid design pops up and adds interest to the flowers and leaves. Notice that black frame? It is hard to see in the photo, but it has a great woodgrain pattern. It's from a cool set called Letterboard Love. The sentiment is from Tiny Sentiments. And just for fun, here's a second card I made with the Grid Background. This also uses the popular Script Greetings set. If you haven't checked out RAH and its products, I hope you do so. Nicole has a gallery set up with inspiration for each set and it's full of great ideas. Disclosure: RAH sent me the Tiny Sentiment set last year. I paid full price for all other products. MOOD WHEN DONE: It's National Craft Month. Everyone get in a good mood! Love the grid background on the flowers! (And repeat after me—“you do not need the script stamps. You haven’t stamped in forever! You do not need the script stamps. You have not stamped in forever! I just discovered your blog, Joan - a better-late-than-never adventure on the Reverse Confetti and Sweet Petunia Hop. I thought Nicole's NCM challenge was over - so I am doubly-delighted to read today's post! Off to my craft room to play!! I'm thinking background stamps are making a comeback. There is definitely something about making your own, but I have all that designer paper... thankfully it's still a thing, too. Your cards are completely awe-worthy, Joan! Naturally I had to follow all your links. I get in trouble that way. 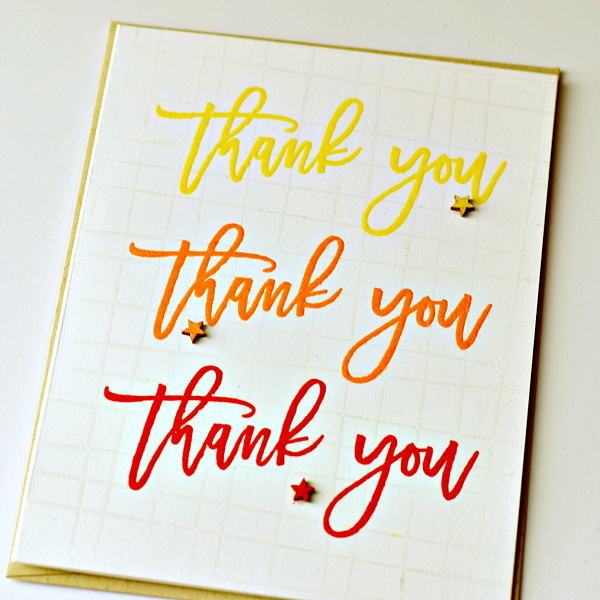 Love the graduated colors on your thank you card. I love both of these. The grid stamps looks great embossed and pale behind the sentiments. Those little stars look perfect.